As an experienced blogger, I realize everyone is bombarded with a multitude of items to read each day, so as I am on, “vacation,” too, I will just offer a few words followed by some photos of an event we attended on Saturday. 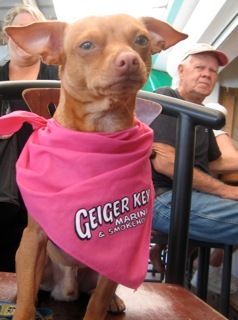 This year, as we have in the past three years, we made our annual visit to the meaningful Woofstock event in Islamorada, Florida. As fate would have it, our rental was in walking distance this year! One of the more rewarding aspects of Woofstock is seeing numerous dogs of all shapes and sizes wearing their, “Adopt Me,” vests. As they are paraded throughout the event, they seem to enjoy all the exercise, excitement and the attention from potential adopters. As Rich and I watched the Lure Course event, we laughed at the antics of the dogs that were partaking. Some are born to it, whipping after a lure at the speed of light. Others, however, decided mid-course it wasn’t worth it and changed course…one stopped and let’s just say he practiced another sort of movement. One adoptable dog named Parker did not truly get the chasing concept, he was just too happy trotting with his handler around the ring. A spectator noted how Parker would make someone a great companion. But while we watched, the event took a sobering turn for me as I looked down at a posting that informed attendees that only 61 percent of all dogs that enter a shelter come out alive and that 32,000 Companion Animals are put down each DAY due to overcrowding in so many mismanaged and underfunded shelters and of course careless pet owners. A groovy dog gives Peace a Chance at Woofstock! A patient Portuguese water dog poses for a pic. This dog is enjoying Woofstock BIG time! Sandy Tuttle and Kip McManus with some goovydoodles enjoy the scene! Some dogs preferred the “carting” course! Making some Homestead, FL, connections. Some dogs sought the cooling waters of the public beach. The other day at the Key Colony Beach Day event held in the Florida Keys I met a stunning Standard poodle. Her human explained that this beauty had been rescued and was a joy to have. 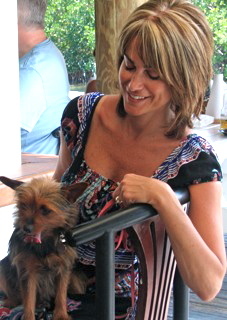 I don’t recall the dog’s name, but upon meeting her I was reminded of my late beloved Hooper. This year is the first time Rich and I are not traveling with her. She had accompanied us on trips to Florida for almost a decade before passing way too young at the age of ten last August. The dog also reminded me of John Steinbeck’s classic book, Travels with Charley: In Search of America published in 1962. The book was based on the author’s road trip made in the fall of 1960 accompanied by his beloved black poodle named Charley. The book relayed Steineck’s views on the vanishing “localism” of America and the destruction of our Nation’s environment. On the same day I met this big poodle, (let’s call her Charlene) I happened to catch an interview with a columnist named Bill Steigerwald who was discussing how he had retraced Steinbach’s journey through America. Steigerwald came to the conclusion that Steinbeck had infused some portions of his cross-country trip with some artful and creative writing inspired by the “characters” he met along the way. To many scholars and those who enjoy the book it doesn’t really matter. They embrace the spirit of a great story teller sharing the road with his fuzzy best friend where every turn of the bend offered a new adventure. My husband Rich always loved Travels with Charley and called our own road trips with our Portie, Travels with Hooper. I bought him a copy of the Steinbeck book just before we welcomed Hooper into our lives. 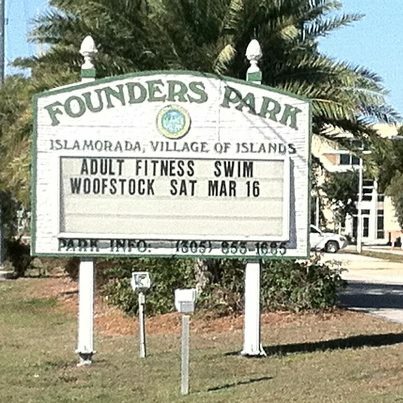 I thought about all this when I took a run through Founders Park this morning near where we are staying in Islamorada. I found myself walking under a shadow of sadness; the last time I had been in that park was with Hooper during last year’s occasion of Woofstock, a local celebration of the canine. In our grief over the loss of Hooper, Rich and I did everything possible to discourage the addition of a new dog. We agreed to let a year or so pass before actually considering having another dog. That included planning a vacation that featured a rental with a strict, “no dogs allowed,” policy and flying to our destination instead of taking our annual drive. Well, that plan went astray when instead of relinquishing our foster dog named Teddy we decided to give him a home. With our travel plans set we were fortunate to have good friends and family members to take care of our Teddy. We hear that he is enjoying himself so much we wonder if he will want to return to us! Will Judy, in his founding of National Dog Week, urged dog lovers to respect the rights of those who did not feel the same way about dogs. Some places are just not going to welcome dogs and they have their reasons. It’s just good to know we have choices. Even Steinbeck was forced to kennel Charley during portions of his journey. In eleven days Woofest will be in full swing over at Founders Park. I look forward to being surrounded by hundreds of special dogs and their humans with all kinds of fun events that involve Man’s Best Friends featuring Search and Rescue Dog and Agility demonstrations as well as Aquatic Pool activities and of course lots of adorable adoptable dogs in search of good homes. I have come to understand that someone who is a dog lover and writes about them almost daily shouldn’t sign a “no dog” lease…If you enjoy being around dogs, no lease, no fence, no barrier can keep a loving canine out of your homes and hearts and vacation rentals. When this time in paradise comes to an end you can be sure we will be anxious to begin a new chapter in our lives titled Travels with Teddy: In Search of Dog Friendly Places!